Here is more photos of the previously mentioned shop. With an open side and no roof it allowed all the individual foods to be visible and not hidden in the shadows. All the bits that I had treasured have a home! So many treasures and memories tied to them. I loved the wicker table. I recolored the table top to blend better to its companion pieces. I created the doilies. Draped doilies always seem to add elegance and warmth, at least to me. The cabinet on the right was from Philly show a few years ago. Brought it on a whim but had no immediate home for it BUT now it is looks perfect in here. The tiered wire stand allows the individual foods to shine. 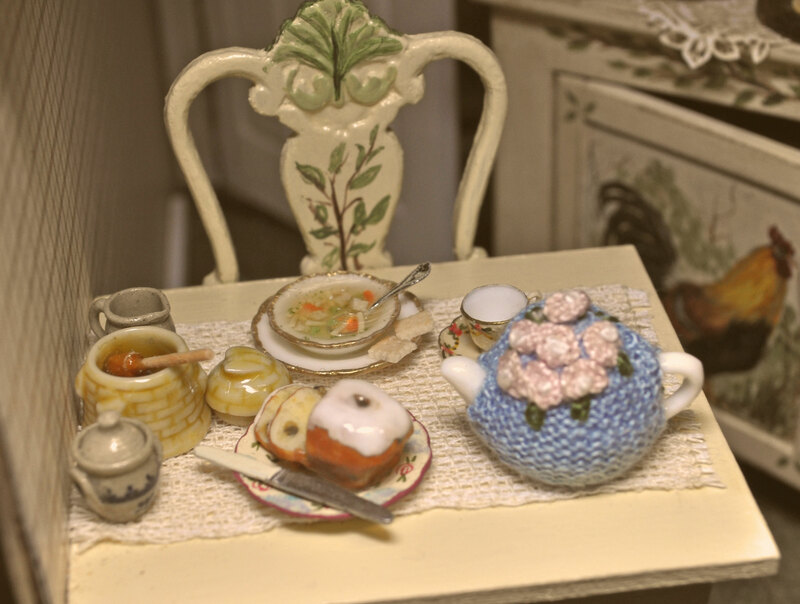 Love miniature foods especially the sweets. Yummy without the guilty pounds! I started this blog about a year ago and really just let it set idle. I think the problem was no set purpose to the blog. I wanted to share some of my thrill of creating miniatures, I just didn’t have a clear vision how to present it. The internet has allowed people to share far and wide. It has became our community. Due to all the inspirations I have found helpful, I want to give back some of that. I love the journey from a mere idea to a captured mini version of some object or scene. I relive the journey when I look at it, all the time spent making it or all the things I have purchased to fill it. Perfect contentment. I took a class from Carl Bronsdon at a NAME convention in 2014. It was a structure that captured a beautiful facade but allowed you to really see the inside well. One side and roof is absent so the detail of my minis really shine. Here is the whole kitchen. It brims with food and china. I can imagine that is it smells inviting from the freshly made soup and warm cake. All that snow is outside but I am toasty inside in the kitchen. Below is a peek in the hutch, no need to go to the store, enough for many more meals. I created this cozy kitchen corner some time ago but decided it was an appropriate image for this batch of cold weather lately. 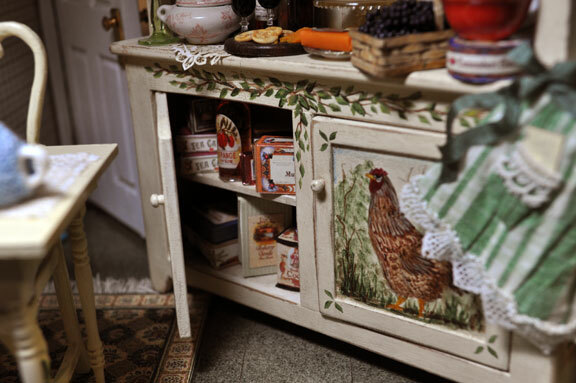 The painted hutch was by Becky Brown many years ago. It set the tone for the room. I started digging out various chicken related pieces to add to the room and it became this warm inviting kitchen. 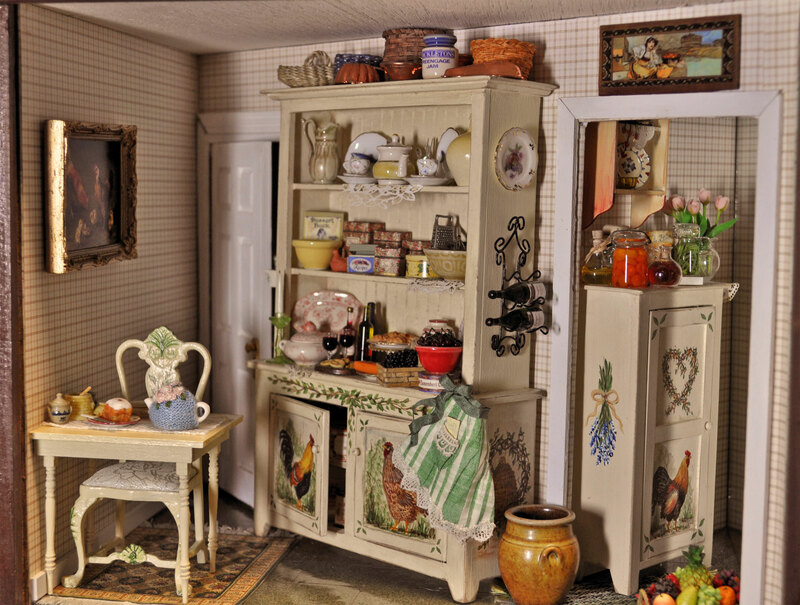 There is another small cabinet in the pantry, a terra cotta hen on the shelf, a framed picture of chickens in the barnyard and of course the bowl of chicken soup on the table. Hot tea in the teapot with honey ready to sweeten it to go with the soup. Then a slice of freshly baked cake warm from the oven. I think a short afternoon nap may be in order after this meal.